UPDATE 2: RollerCon is losing its current home, but the event will still happen in Las Vegas as scheduled—at a TBD venue. [UPDATE 2 – 2/20/15] Things are starting to go down, and big time. The LVCVA has made the purchase of the Riviera official, and are not beating around the bush in its plans to expand the Las Vegas Convention Center at the casino’s expense. The property will close on May 4, 2015. That’s a problem for RollerCon, which is scheduled for July 22-26, 2015, twelve weeks after the Riviera shuts down for good. That means the roller derby convention does not currently have a place to convene. As a part of the deal with the doomed hotel, its property management company is working with the LVCVA to relocate booked conventions and meetings, as well as guests with reservations, that are scheduled at dates past May 4. This means that, according to RollerCon staff, “cancelling your reservation is a very bad idea.” Concrete details on what exactly this means will come later, but the bottom line here is that if you had booked a room early, you’ll have a room come RollerCon—maybe an even better room than you have already paid for. While RollerCon is figuring out what to do next on their end, it has some slight changes as far as what skating attendees and volunteers have to look forward to in the weeks ahead. Challenge bout scheduling will still open on March 1—”and we’re still recommending you fill it out at midnight oh-one if you want to get a spot,” reminds Ivanna—but they will not actually be scheduled until a new venue is secured. On the other hand, volunteers looking to work towards discounted/free admission in the future are being asked to hold off on signing up for the time being. How much staffing and scheduling will be needed will be an unknown until a new spot is contracted, since reorganization of shifts may be required. It may also be hard to see a place you love be reduced to rubble in an instant; the LVCVA is said to be looking to schedule the implosion of the Riviera before the end of 2015. [UPDATE 1 – 2/18/15] Several Las Vegas news organizations are reporting that the land that occupies the Riviera Hotel & Casino will indeed be purchased by the Las Vegas Convention and Visitors Authority, who will be putting through final approval of the sale on Friday. Once that happens, the Riviera will have six to nine months to live, after which point its property managers will have “to close and vacate the building.” It is expected for this closure to happen in mid-August. RollerCon is scheduled for late July, just a few weeks before the scheduled drop-dead date. This is pushing it awfully close, potentially leaving the roller derby convention without a home at the last moment. However, as of this update everything is still a go for July 22-26, 2015, in the Riviera. We will keep you posted. [ORIGINAL STORY] With the 10th anniversary of RollerCon just five months away, you can almost hear derbyfolk from far and wide counting down the days until roller derby’s biggest party and/or skating convention happens at the Riviera Hotel & Casino in Las Vegas. However, today’s calendar checkoff came with the surprising but as of yet unconfirmed news that the Riviera may be soon closing so that it can be demolished—leaving RollerCon without the place it has called home since 2011. It may be gone before long, but not before another RollerCon or two. If you’re starting to freak out that the hotel you’re planning on staying in for RollerCon may be nothing but a pile of rubble come July, don’t worry. The Riv isn’t going anywhere for the foreseeable (read: the next few months until RollerCon) future. The details as to what is actually happening to the property will explain why. Las Vegas is a constantly evolving city. At least, the Las Vegas Strip is. You can count on seeing multiple buildings under construction along the famous boulevard every time you visit, as “new” Vegas continues to replace what’s left of the “old” Vegas. The Riviera is certifiably old Vegas. It’s one of the oldest hotels still in operation, having opened 60 years ago in 1955. Recent construction around the Riviera and on the northern portion of the Strip in general has meant less foot traffic outside and even fewer bodies mingling about the casino floor. This has caused noticeable impact on the Riviera’s bottom line over the last decade, to the point where it had to declare bankruptcy in July 2010 to settle its debts without going under completely.1 The property has been in an “it’s only a matter of time” state for years, basically. So it seems that time has come. Reports state that the Riviera will be sold off to the Las Vegas Convention and Visitors Authority, so that it may be “closed and leveled for non-gaming use.” The authority has plans to double the footprint of the adjacent Las Vegas Convention Center, and razing the convention space—and struggling hotel and casino space—of the Riviera seems like the most efficient way to follow through with them. 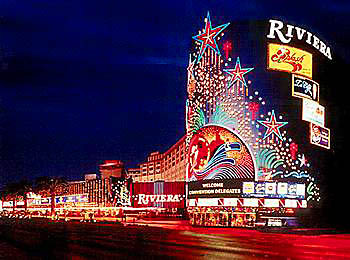 An official announcement on the fate of the Riviera Hotel & Casino is scheduled for February 17. It’s extremely doubtful, but if that announcement reveals new information that unduly affects RollerCon 2015, 2016, or beyond, we’ll update this space with the story. And then in July 2011, along came RollerCon to save them from financial ruin. Coincidence? I think not!? !